Between 1926 and 1968 the General Post Office introduced eight public telephone kiosk types. 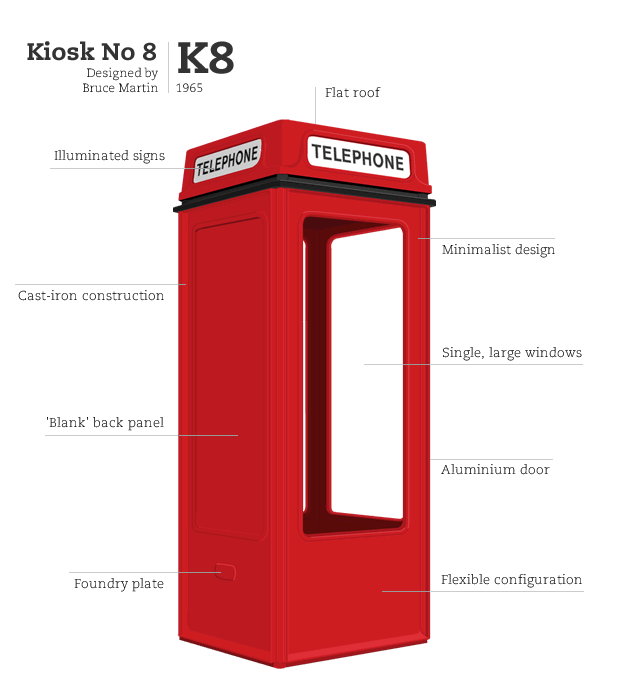 The K8 was the final design, a replacement for the K6, designed three decades earlier by Sir Giles Gilbert Scott. The K8 never matched the success of the K6, but some 11,000 examples were installed across Britain. Despite this the number of surviving kiosks is relatively small. Only 54 surviving K8s have been identified, a tiny percentage of the total number of K8s manufactured. The K8 kiosk is constructed of cast-iron sections, bolted together, standing on a narrow concrete base; the kiosk stands wider than the concrete base so that the kiosk 'floats' above the ground. Its general form is a four-sided rectangular box with a flat roof. Three sides of the kiosk are glazed, each with a single three-quarter length pane of toughened glass. The back panel has a blank, molded panel conforming to the dimensions of the windows. There is a thin, projecting architrave - painted black - above the main body of the kiosk. The roof is formed by squared-off pediments, with curved corners and a flat roof. The faces of the pediments are tilted back slightly. Set into each face is a slot for an illuminated telephone sign. Unlike previous kiosks the signage uses sans-serif capital letters on opaque glass. A gap was purposely left beneath the door for ventilation. The prefabricated design allowed the kiosk to be installed in any configuration with the door, side and back panels placed in any position. The K8 consists of just 183 individual parts compared the K6, which was made up of 450 components. There is no Royal crown on the exterior of the kiosk. It took another six years after the failure of the K7 to enter final production before the General Post Office looked again for a new national telephone kiosk. Neville Conder, Bruce Martin and Douglas Scott were invited to submit proposals. Conder withdrew during the design phase, perhaps his experience designing the K7 served to dissuade him from working with the General Post Office again. Martin and Scott both submitted designs. Martin proposed aluminium and Scott the use of cast-iron with stainless steel trim. Martin's design was preferred, but it only entered production after a redesign of its structure introduced greater structural rigidity. Not only that, the General Post Office again refused to switch to aluminium instead using cast-iron, a legacy going back to the K2. An initial order of 1,000 kiosks were commissioned, with the first being installed in Westminster on 12 July 1968. A further 10,000 were installed over the next 2½ decades. 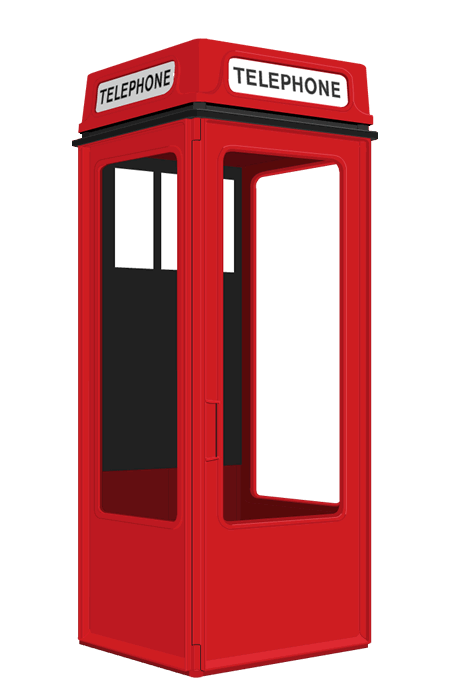 The K8 proved to be the final kiosk produced by the General Post Office, entering service 42 years after the K2, the original red Telephone Box. Despite its young age compared to the K6, a small fraction of the total number of K8 kiosks were retained by British Telecom following privatisation. Between 1968 and 1983 11,000 examples of the K8 were installed. There are currently 10 separate listings for the K8 kiosk with English Heritage only. The Twentieth Century Society is campaigning to list more K6 kiosks. There are approximately 54 surviving kiosks. Of the eight kiosk types introduced by the General Post Office, the K8 was the third most populous type introduced, and the third most populous type in terms of surviving kiosks. However, the percentage of surviving K8 kiosks, about 0.5% of all K8s, is very low.